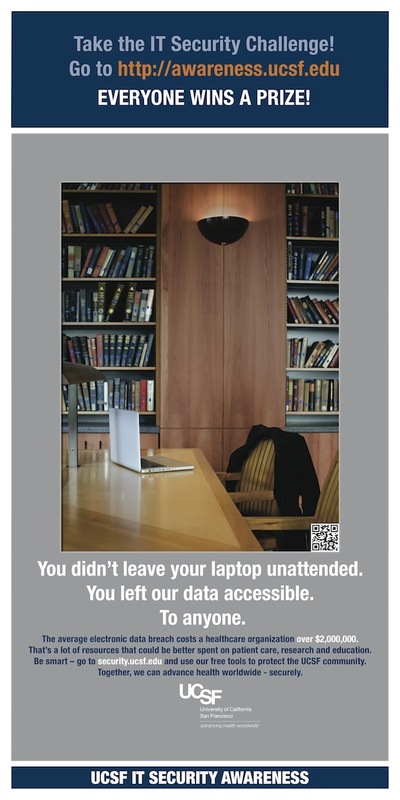 Due to the recent theft of an employee’s laptop UCSF would like to remind all employees of its campuswide IT Security Awareness Campaign. The ongoing campaign includes tips and training for safeguarding private data and University data assets, and is a reminder of the utmost importance of protecting patients’ personal and health information. The loss of a lone laptop can add up to hefty costs, including time and resources better spent elsewhere. Since 2005, it is estimated that information security and privacy breaches have cost UCSF more than $20 million. The campaign features a multimedia approach to educate everyone at UCSF about the numerous free and simple solutions available acrosss the University to help maintain data security. More information is available on the campaign’s website. See below for some simple ways to help keep information secured. 1) Stop, think and then connect. If you receive an email that is too good to be true, or suspicious, it probably is. These emails "phish" for your login credentials or other private information. The best defense is common sense. 2) Encrypt your laptop, smart phone and tablet. Encryption prevents UCSF data and your personal data from being exposed. Free software is available from http://security.ucsf.edu or by calling the Help Desk at 415/514-4100. 3) Install the UCSF anti-virus solution on any Mac or PC used for UCSF work. Free software is available from http://security.ucsf.edu or by calling the Help Desk at 415/514-4100. 4) Do not leave your laptop or smart phone unattended. Physically secure your laptop with cable locks, which fasten to a fixed object such as a desk, to deter casual theft. These locks are available through CDW-G and OfficeMax, both of which are in BearBuy. Also, remember to lock your office doors. This is one of the easiest ways to prevent theft. 5) Be aware and a good steward of UCSF data. If you see someone mishandling data, either intentionally or inadvertently, report it to [email protected].